NIALL Browne never got to play with his hero. In Two Mile House, Maurice Colbert was football’s first immortal. He partnered Niall Buckley in the Kildare midfield as the county minors won the 1991 Leinster championship. The following year they graduated to the under-21s and anchored the Lilies to another Leinster. By the time Colbert captained his club to the Kildare junior championship title in 1994, he was just 20. After ’98, Browne could only work from memory. Colbert’s career was cut short when a freak injury during a club championship game left him blind in one eye. His vision returned six months later but football was gone forever. “It breaks your heart because the game starts and you just stand on the sideline,” says Colbert, who was 24 at the time. His absence left a massive void, for him and for his club. It was like the team of ’94 had disappeared overnight. The players coming through were too young to shoulder the burden. There was one consolation though. Niall Browne was among the emerging generation and Colbert had already glimpsed his successor in the Two Mile House midfield. One memory is still vivid – an underage game and the House had just been beaten. “Sure you only lost, you were the best player out there,” Colbert’s mother told the teary-eyed boy but her sympathising pleas made no impression on a distraught 10-year-old. There are football friends and then there are non-football friends. And for that reason there are two Niall Brownes. Mr Chalk is laid back and easy going but he’s rarely seen these days. Whatever he was like off the pitch, Browne was not always the nicest on it. When he gazes into his football past, a dark vision emerges. Managers and teammates will attest to that. Those who knew him best suffered least. Mattie Kelly would throw his eyes up to heaven. Mickey Burke and Shane Darcy took no notice. Those three remain his closet friends. Ignorance was bliss but few knew the extent of Browne’s own frustration. A county footballer from under-14 level all the way up to senior, the boys at home called him splinter-arse. Being sidelined was bad enough but his biggest problem was only exacerbated by sitting on the bench. It was hard going from club – where he was the driving force – to county – where he was peripheral – but at college he blossomed. DCU were in the early stages of establishing an academy when Browne pitched up for a Business Studies degree. Playing alongside future all-Ireland winners Stephen Cluxton and Bryan Cullen, it was the beginning of a football education. “I was one of the first getting Cluxton’s 70-yard kickouts on to my chest,” Browne remembers of his time at third level. He shared a house with Ballyteague’s Rob McCabe, Dublin’s Paul Casey and Monaghan’s Owen Lennon, who captained the Farney men to last year’s Ulster title. Success eluded that group in the Sigerson Cup but Browne was keeping county men out of the side. His confidence soared but just as quickly he was shattered again. As he struggled to finish his degree, football became a source of frustration again. 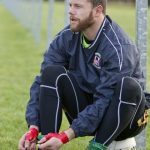 He was fatigued from the fever but he was also fed up playing with the whipping boys of the Kildare junior championship. Promising junior footballers invariably attract attention from bigger clubs. For a long time the belief was that you needed to play senior to put yourself in the shop window for county football. Browne was ambitious and so long as he was just one of a handful at training, it was tempting to leave. Patience had never been one of his virtues but now he knew where his loyalties really lay. Browne’s decision to stay coupled with Mark Millham’s arrival in Two Mile House set the club on a new path. Millham – a senior championship winner with Naas in 1990 – was organised and determined to succeed. He also had the sense to bring Maurice Colbert on board as a selector. On the back of a Minor B championship success the previous year – a team coached by Browne and featuring future all-star Peter Kelly – the seeds of the club’s current success were sown in 2006. Millham didn’t deliver a championship but he got them winning games again, enough to earn promotion from the league’s basement division. Progress. The following year they reached the junior final. More progress. They lost to Ballykelly by six points but they were learning all the time. Two years later they were back in the final and leading by two points at the end of 60 minutes. They were finally ready to progress out of junior for good when they suddenly stalled. Straffan stunned them with an injury-time goal. Two Mile House entered the last year’s junior championship as overwhelming favourites for the title but how can you be fancied if you keep losing finals? It was hard to believe that victory was inevitable with the memory of 2009 still alive. Clogherinkoe rekindled it in 2012, netting another late winner. That meant the House had actually won the championship twice during normal time. Entering the 2013 final against their old nemesis, Straffan, there was more than a game at stake. Once more the House held a two-point lead entering injury-time. Once more a stubborn Straffan side refused to quit. They were just about to launch one final attack from midfield when the House were finally shown some mercy. That final whistle was pure bliss. 19 years after watching his hero collect the trophy, Niall Browne retraced Maurice Colbert’s footsteps. Colbert was there to witness it all – to see that teary-eyed ten-year-old take on his mantle. “He’s a phenomenal personality. He is the driving force behind the team,” says Colbert, describing the 31-year-old who now captains the club. It’s the kind of tribute Browne always wanted to hear. “He was the guy you’d look up to because he was such a professional and he was so big and strong. Only now Browne has the chance to do something Colbert never could. TO think that he almost transferred to another club is unimaginable now. Two Mile House are on the brink of something special and they wouldn’t be here, preparing for an All-Ireland final at Croke Park next Sunday, without him. The semi-final was heading for extra-time until Browne popped up with the winner – his fifth point of the game. “When the game is in the melting pot, rather than fearing that we try to enjoy that period,” says Browne, reflecting on the way in which the team have changed over the last 12 months. “The Leinster championship and the All-Ireland semi-final, that was enjoyment,” he adds. Experience has taught him to savour these moments. His influence has grown year by year, not merely because of his performances on the pitch. Last season he managed the minors to the county final, striving to ensure the next generation avoid the same mistakes he made. If Browne was to have his time all over again, he knows what he would do. “I’d have gone down to Clare when I was 18,” he says of the decision he made to play with his mother’s native county in 2010. “It was like going away and finding yourself as a footballer. When you’re up in Two Mile House and involved in Kildare panels, you’re worried what everybody else thinks. I was given opportunities with Kildare and just didn’t take them. I probably didn’t believe in myself enough to make it. Browne played Munster championship against Cork and Kerry, learning more in 10 minutes against Aidan Walsh than he would in three months playing club football. After his failure to make the breakthrough with Kildare, he was willing to drive two hours south on a Thursday evening after work just to further his inter-county career. It begins and ends in Two Mile House. From the moment Declan Andrews built a set of goalposts for the Browne’s family farm, football captured the imagination of their youngest boy. On Sunday morning Niall Browne will only be a mile from home when he leads his local team out of the village on the way to Croke Park for the biggest game of their lives. “Playing Sigerson Cup and underage and junior with Kildare. It was more a kind of individual thing, where you were trying to beat your man. Whereas with your club it’s a collective, you don’t want to let anyone in your local area down or any of the lads you know so well.